Transatlantic borrows quite a few concepts and mechanics from an earlier Mac Gerdts’ game, but I’m going to try not to name that game until later and focus on Transatlantic in a vacuum. In Transatlantic there is no map or area control. Instead there are sea regions where players compete in shipping and are trying to outclass opponents ships with faster, heavier or higher passenger capacity ships. 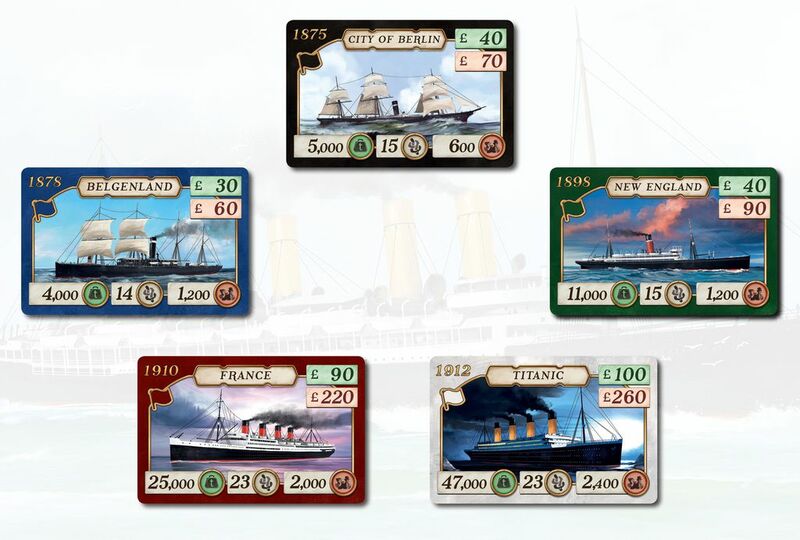 Players all recieve a small player board which holds different good tokens that match the flag colour of the ship cards in the game. These will function as multipliers when scoring points from your ships. Players also start with a sail ship and one steam ship. A large part of the game is to acquire new ships, that players then deploy into a sea region, where they’ll earn players money. With money players can buy new and better ships, or buy trade houses which can earn points during the game. This happens when a player ships in a corresponding sea region. Newer ships being deployed into a sea region can push older ships out of business and eventually these ships will be scrapped. When a ship is scrapped you gain points according to the good tokens in the matching colour you have, added by the number of ships of the same colour in the docks. So how does this all work out in players turns. Well players have a starting hand of 7 cards that they use to perform actions. Each turn you play a card en carry out the corresponding action. One of the 7 cards allows you to take the cards you played in previous turns back into hand and lets you acquire new cards for your ‘deck’ from an open supply of 5 cards. The cards players can acquire are upgraded versions of the cards players start with or totaly new action cards. Steam ships require coal to ship so one of the cards lets you add coal to your steamships. Another lets you transport with two ships. Another lets you buy new ships. The meat of the game is deciding when to play what card and how to capitalize on the situation in the different sea regions. Do I want to transport in one sea region, now that my opponent is low on coal. Or should I deploy a new ship or build a trade house first. All meaningful decisions but turns never seem to take long. Strategy for example comes from specializing in certain good tokens and buying corresponding ships, or from specializing in shipping in one region or to diversify between different regions. There are also lots of tactical decisions to be made. For example When to buy ships or when to copy an opponent’s action card. And also where to deploy new steam ships. 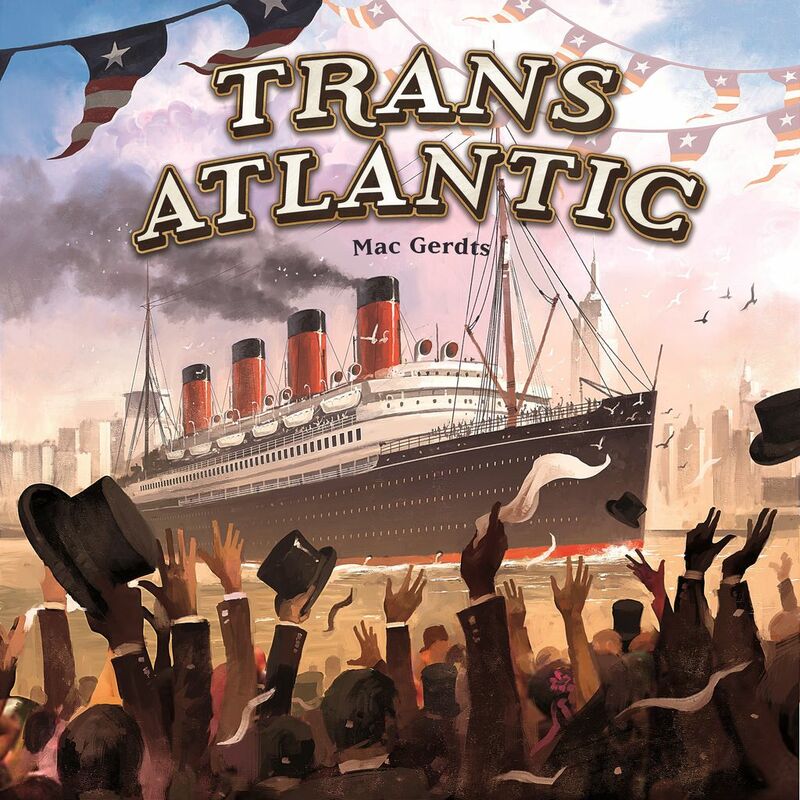 Transatlantic is a kind of side step from what Mac Gerdts has been doing in recent years. It feels like he has said goodbye to the classic rondel for good and changed it into a card based rondel, like the one in Concordia, which works really well. In this game he has also disconnected the scoring mechanism from the action cards itself and adds a multiplier mechanic like the prestige board in his game Navegador. Therefor it all feels less elegant as either Navegador and Concordia to me. But other co-players disagreed with me and found it to be at least as elegant and reminded me that Transatlantic has only one currency that is money. No more need to buy and sell goods. Transatlantic is all about the ships and that is a good thing. While there are other ways to score points, the biggest amount of points come from making your ships worth a lot of points. The steam ship theme works great with the mechanics too. As the ships get newer they improve their stats and older ships eventually get scrapped. With all the different action cards players can choose from and the included variants Transatlantic definitely has enough -. The components are fine, good quality overall. The game comes with an insert for the game box and also a nice historical booklet about all 50 ships in the game. The elephant in the room.. Does Transatlantic replace Concordia? If you love the hand management mechanic found in Concordia I would say that the designer improves on this in Transatlantic. The trade-off is that Transatlantic removes the spatial element of connecting regions and the area control on a map which some might people like a lot. Some graphical errors. For example colours don’t always match between cards and tokens. In Transatlantic you basically select a card from your hand and carry out its actions. Complexity of the game comes from reading the game state and adapt your play accordingly. There might be some interpretation questions regarding the effects of some of the action cards, and the rules give a hard time explaining for clarification. The game comes with a few variants to keep things fresh. The President card for example replaces the Director action card and adds contracts to the game. The game is actually designed with the President variant and the Director card makes the game a bit easier if you would like to play a somewhat easier game. Yeah, it was quite bad and I don’t understand why. It feels like they rushed the production in the end to be able to have it at Spiel 17.